That's all I can say, Great JeansSize down. Please never stop making these Comfort Waist Jeans Diane. They are truly comfortable and fit perfect. At 5'5", 155lbs the medium is the right length (with or without heels) and fit my body snug but not too tight. I'll probably get more! The BEST DG2 Jeggings ever! Three years ago there was similar fabrication which I loved and I have been patiently waiting for their return. 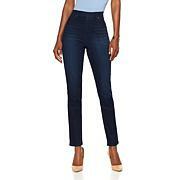 These are wonderfully soft, have the look of jeans, the comfort waist with the slim waistband and they are not so stiff that there is a problem pulling them up if you have larger hips like me. I am THRILLED that these have returned with added features. Love the bootcut and all the traditional colors as well as the fashion colors. I purchased several pair of these. LOVE, LOVE! These are the best fitting pants that I own. 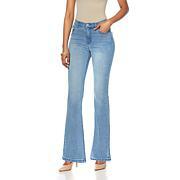 DG2 by Diane Gilman Comfort Stretch Jegging - Fashiom The look of denim in a comfy jegging. Wear these tucked into boots, with simple flats or edgy booties. Perfect for travel, weekends and an endless array of day-to-night ensembles.